(JTA) — An attack on a Jewish restaurant and its owner during last month’s riots in an east German city went unreported by law enforcement for several days, fueling anger by Jewish groups. During anti-migrant demonstrations in Chemnitz that turned violent on Aug. 27, about 12 masked neo-Nazis injured Uwe Dziuballa and vandalized his Schalom restaurant, according to Die Welt newspaper. The attackers allegedly threw stones, bottles and a sawed-off steel pipe at Dziuballa and shouted, “Get out of Germany, you Jewish pig.” A window in the restaurant was broken and Dziuballa was injured when a stone hit his shoulder. Dziuballa has filed charges, according to the State Criminal Investigation Office in Saxony. He said the police arrived on the scene quickly after he called them, but took a few days to secure evidence and record damage. Police confirmed the incident on Sept. 6; the local news media already had reported on it. The Berlin-based Jewish Forum for Democracy and Against Anti-Semitism learned of the attack on Sept. 5 through the media reports and obtained photographs of alleged attackers dressed in black in front of the establishment. Germany’s new commissioner against anti-Semitism, Felix Klein, told the newspaper that the incident appeared to represent a turn for the worse in anti-Semitic crimes. “It is reminiscent of our worst recollections of the 1930s,” Klein said. Charlotte Knobloch, head of the Jewish community of Munich and Bavaria, said in a statement on the eve of the Jewish New Year that the violent anti-migrant demonstrations in Chemnitz were already a wake-up call for the government and society. 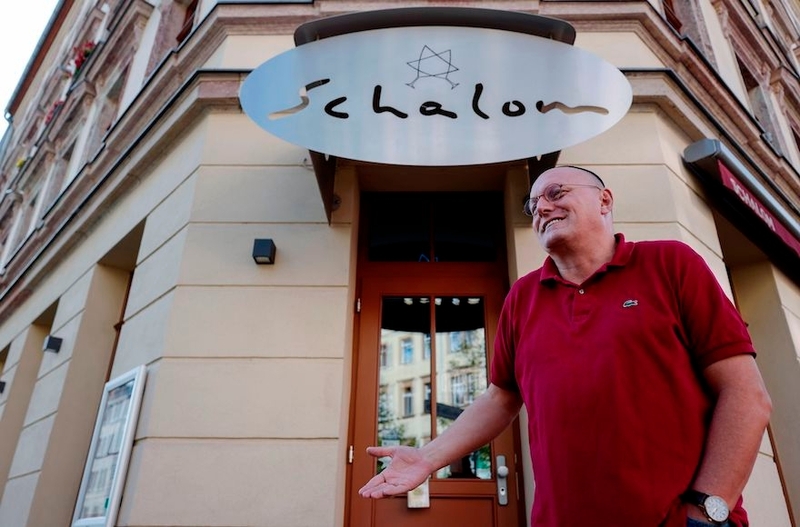 “The fact that there was also a violent attack on the restaurant Schalom and its owner is shocking and underscores the urgency of resolute action against anti-democratic forces,” said Knobloch, who survived the Holocaust in hiding with a Christian family in Germany. Dziuballa told die Welt he has often been subjected to anti-Semitic incidents, such as having swastikas painted on his storefront and pig heads left at the door. He nevertheless continues to keep the restaurant open. The group said the Saxony state office of criminal investigation assured it that “nothing was concealed” and did not always publicize individual cases under investigation.